Daily News Editorial staffer Kumudu Gunasekara and Senani Dushanthi Silva's youngest son Lakvindu Chanudith Gunasekara (10 years) expired under tragic circumstances on Saturday. 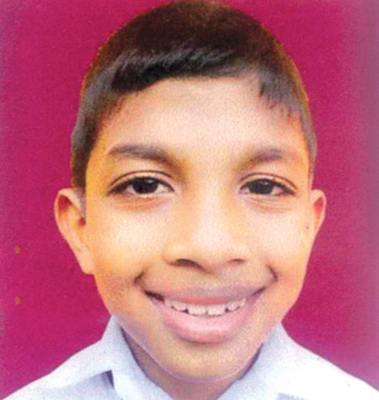 Lakvindu was a Grade 5 student of Christ Church College, Dehiwala and has an elder brother and a sister. Kumudu Gunasekara is the son of former Lake House employee Haripriya Gunasekara. The funeral will take place today (17) at 4.00 p.m. at the Mount Lavinia cemetery. The body lies at No. 208, Galvihara Road, Dehiwala.